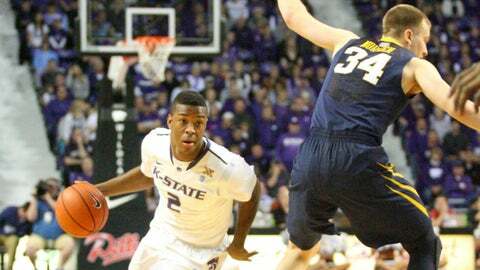 Wildcats guard Marcus Foster had 15 points in Kansas State's dominant win over West Virginia. MANHATTAN, Kan. — Shane Southwell and Thomas Gipson scored 20 points apiece and Marcus Foster added 15 as Kansas State beat West Virginia 78-56 on Saturday. Eron Harris had 21 points while Juwan Staten contributed 16 points and 11 rebounds to pace the Mountaineers (10-8, 2-3 Big 12). Kansas State’s lockdown defense continues to blossom as the Wildcats limited West Virginia to 32.7 percent shooting (16 of 49). The Mountaineers entered averaging 79.9 points per game while shooting just under 46 percent. The 22-point loss was the largest loss of the season for the Mountaineers. The game was West Virginia coach Bob Huggins’ second trip back to Manhattan after spending one season at the helm of the Wildcats program during the 2006-2007 season. Kansas State (14-4, 4-1) trailed for just 2:19 of the contest and led for the final 35 minutes. The Wildcats shot 54.9 percent, their best percentage of the season, surpassing their previous high of 52.5 percent against TCU. After two quick 3-pointers from Harris, the Wildcats answered the lone push of West Virginia by going on a 17-5 run and opening up a 20-13 lead with 8:43 left in the first half. The Wildcats shot 58.3 percent from the field in the first half as well as going 5 of 10 from 3-point range. Southwell paced the Wildcats with 12 first-half points while Gipson contributed eight points. Southwell’s performance included an assist on an alley-oop dunk for Wesley Iwundu as well as a dunk of his own, pushing the Kansas State lead to its largest first-half lead of 15 points with 1:15 left till the break. Thanks to a quick 3-pointer from Marcus Foster, the Wildcats opened up the second half on a 15-6 run and continued to dominate the defensive end of the floor. Outside of the production from Harris and Staten, West Virginia struggled mightily, shooting 22 percent (6 of 27) from the field. With the win, Kansas State has now held 15 of its last 17 opponents under their scoring average. It has also held 10 opponents under 60 points. Six points capped off Gipson’s performance in the final 3 minutes of the game, including his last with 1:25 left.